We analyse the extent and evolution of informality and inequality in the Serbian labour market between 2002 and 2007, using data from the Living Standard Measurement Surveys (LSMS). Two surprising results emerge. First, the level of informal employment has risen significantly over the period, despite strong economic growth and the introduction of a range of market-oriented reforms. Second, the level of inequality in earnings seems to have remained more or less constant over the period, in contrast to the experience of other countries at a similar stage of transition. 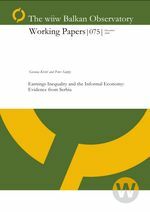 We show that informal employees earn significantly less than those in the formal sector, controlling for a range of other variables, and informality plays an increasingly important role in explaining earnings inequality.